Right in the middle of town, in the bubble that is the Inner Stadt of Vienna, there are lots and lots of independent shops. And many of them look very dated. 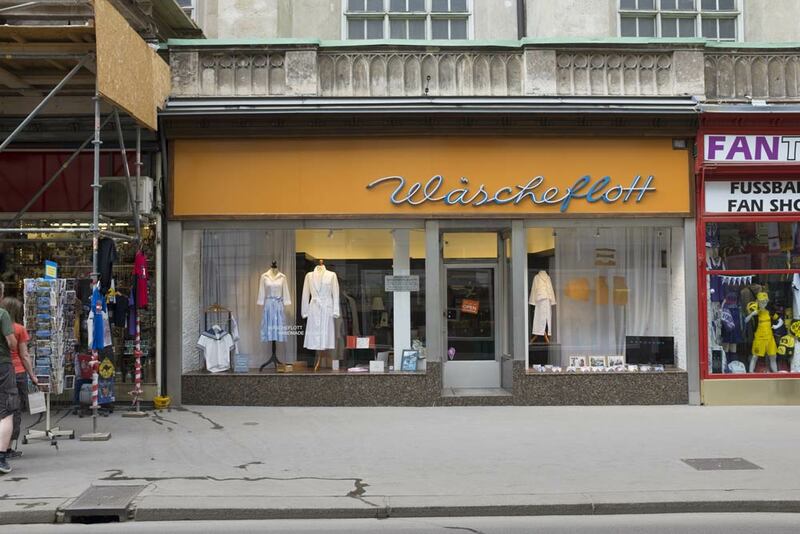 Washenflott has a sign in English in the door that reads ‘Yes, we are open’. That alone is enough to show that this shop is in the part of Vienna visited by foreign tourists. But where? In fact, it is just a few hundred metres from the Michaelerplatz, which is the circular Square (now there’s a thing) that is the hub of the Inner Stadt. 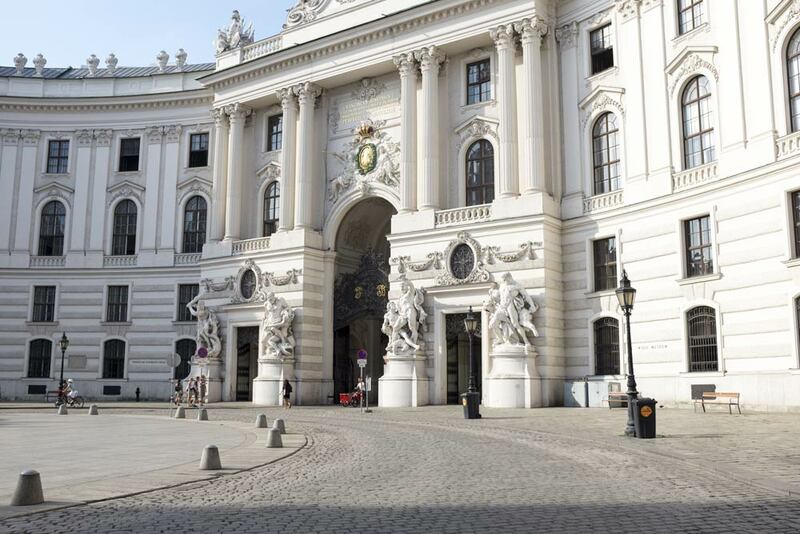 The Square/Circle gives onto the Vienna Riding School, the museum of Empress Elisabeth of Austria, (otherwise known as the Sisi Museum) and on to numerous grand buildings. It is usually full of tourists, but I photographed it early in the day. That was easy and convenient to do because our hotel was just a hundred metres along the street from here. Usually there is a line of horse-drawn carriages (known as fiakers) drawn up like a taxi rank around the Michaelerplatz as you can see here. They are waiting for passengers (tourists) to take them on circular rides around the old city. This next photo is a fiaker driver tending his horses. Notice the little pointy caps on the horses’ ears. I thought they might be to insulate the animals against the traffic noise. 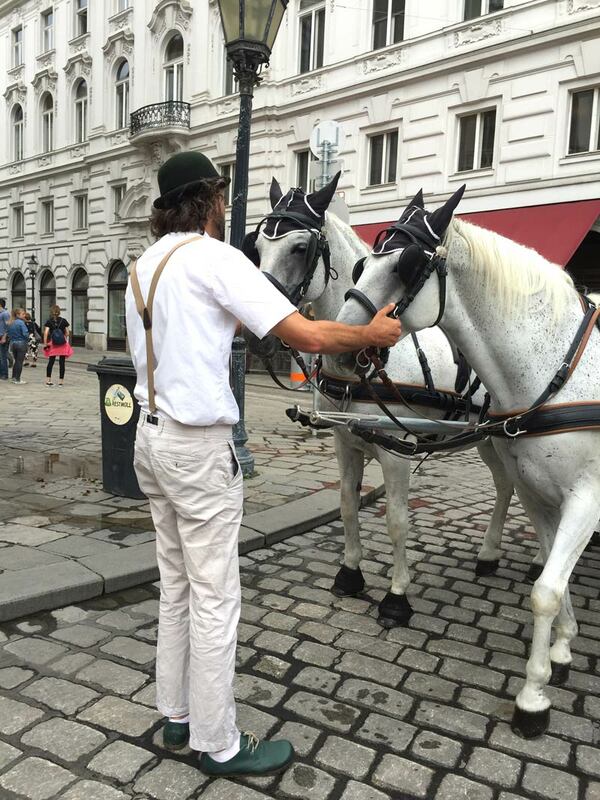 Tamara asked one of the fiaker drivers and he said they were to protect the horses’ ears from bothersome flies. We eventually did take a fiaker ride in Salzburg and we took the opportunity then to ask the drivers. Salzburg fiaker horses do not have ear covers and we asked why. You would think (wouldn’t you) that there would be a brotherhood of fiaker drivers across Austria and that they would know every tiny detail of how they do things across the land. 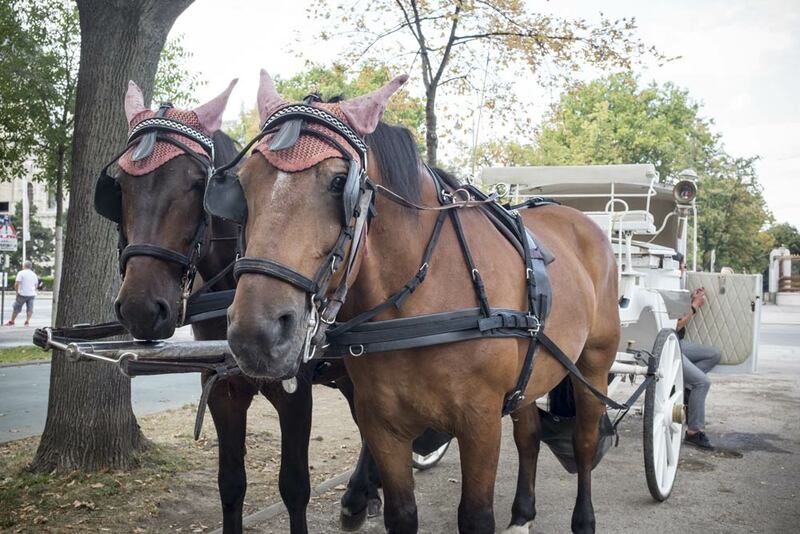 But no, the Salzburg drivers had no idea why Vienna horses had ear covers. 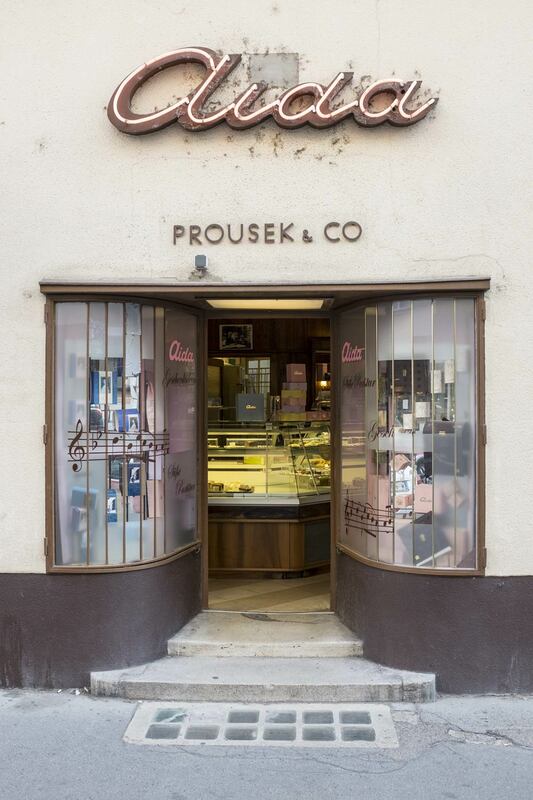 For our second traditional, independent shop in Vienna we have Prousek & Co. It houses one of the many cafes that go under the name Aida, one of a chain of cafes that are dotted around the city and are quintessentially Viennese. Cheating a bit because this little confectionary shop is not in Vienna but is one of many in Salzburg that specialise in Mozart-themed chocolates. You can see a painting of Mozart on the wall outside the shop. And I can tell you that there every kugel and box of chocolate bore one or other image of Mozart. A Mozartkugel (English: Mozart ball), is a small, round sugar confection made of pistachio marzipan and nougat that is covered with dark chocolate. 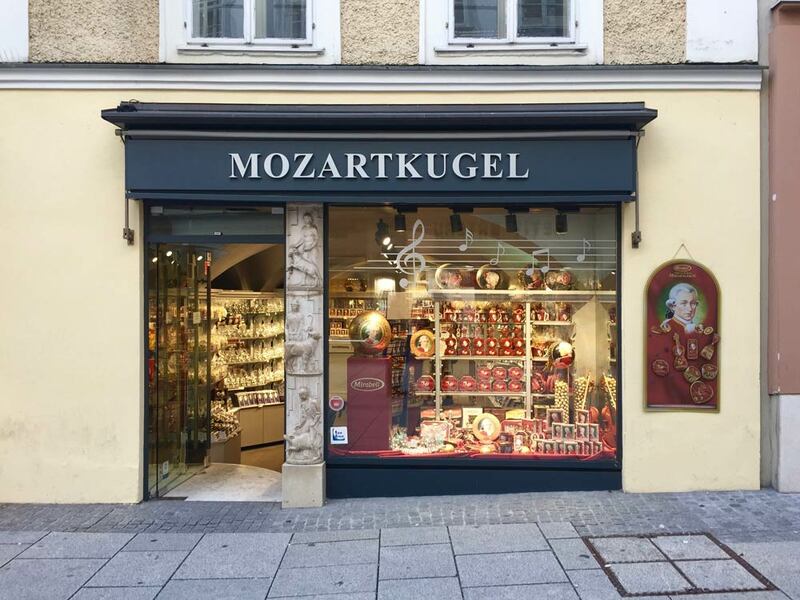 It was originally known as Mozart-Bonbon, created in 1890 by Salzburg confectioner Paul Fürst (1856–1941) and named after Wolfgang Amadeus Mozart. Because they are so lovely, so patient, let’s end with a photo of fiaker horses. 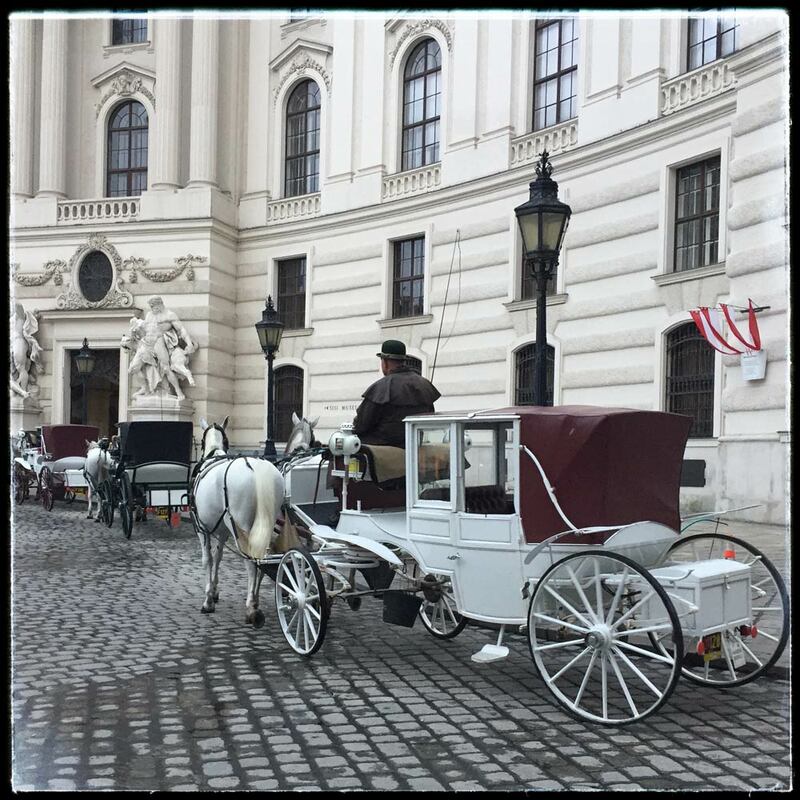 These are waiting on a street by the Ringstrasse that surrounds classical Vienna. There is a story about the Ringstrasse. The city was originally surrounded by fortifications. They kept two sieges by the Turks from taking the city. After the second siege, time moved on and the fortifications were no longer needed. The ring road was built and nowadays trams go around and around. There are two lines, the inner going clockwise and the outer going counter-clockwise. We rode the tram partway around the Ringstrasse, and if you ever visit Vienna, it might be a good (and cheap) way to get an overview of the Inner Stadt of the city.